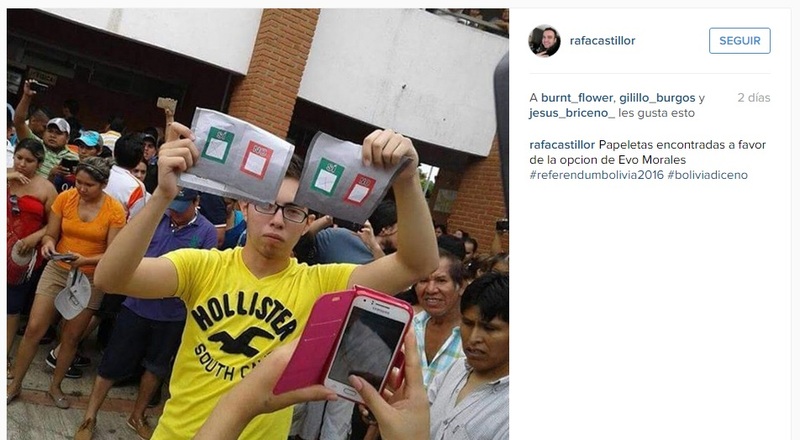 “Found ballots marked in favor of Evo Morales’ option.” Screenshot from Instagram user's rafacastillor's account . Social media has been a crucial platform for citizens to denounce alleged electoral injustice in Bolivian President Evo Morales ‘ referendum on changing the constitution to allow him to run for a fourth consecutive term and possibly serve as president until 2025. Hundreds of images, videos and recorded voices messages taken by voters have been circulating throughout Facebook and WhatsApp since Sunday, February 21, reportedly showing acts of fraud. So far, partial results from the electoral commission OEP  (Órgano Electoral Plurinacional) indicate that Morales has been unsuccessful in sequestering a seat for the presidential race of 2019. With 96 percent of the votes accounted for as of Tuesday evening, the electoral board reflects the referendum's defeat at 51.7 percent against, versus 48.3 percent, a margin of 3.4 percentage points. From voter impersonation to invalid ballots, voters wrote online that they witnessed varying degrees of fraud, largely committed by electoral delegates attempting to manipulate the number of sí votes to help secure a win passing the referendum. The alleged fraudulent acts included unavailable and missing voting materials, burning of pre-marked ballots, statistical misinformation and voter impersonation. Many voters arrived at their polling station to find inadequate materials, forcing them to wait for ballots to arrive after their station had run out, whereas other stations opened hours late because they had not received ballots or electoral registers before the polls opened 8 a.m. Sunday, as I witnessed first-hand. Accusations of missing material from the first to the fourth city circles of Santa Cruz where the NO vote wins. In addition to official media reports, voters from at least one polling site captured on video  the burning of ballots by citizens after they found them in a room with a group of delegates who had checked “sí” on their own accord. Caption: Marked ballots. Fraud. 24th of September School [in Santa Cruz de la Sierra]. [News channel] Unitel should hire me. In Bolivia's largest metropolis of Santa Cruz de la Sierra, the local electoral board TED (Tribunal Electoral Departamental) confirmed that the more than 5,300 voters who were unable to vote  on Sunday due to the burning of their ballots will return to the polls on March 6. The Facebook page of opposition’s advocacy group “Me Comprometo, Voto No” (I Make the Commitment, I Vote No) posted images supposedly revealing votes being falsely attributed as sí as they were entered into the OEP (Órgano Electoral Plurinacional) electoral commission’s system. The images were taken by voters and delegates alike cross-checking their designated polling tables with the information available online. Below, the polling station results showing a clear NO victory. Above, the falsified numbers for the same station. Local newspaper El Día reported cases, some of them uploaded using social media, of fraud in which numerous deceased persons were still eligible to vote and listed on the electoral roll the day of the vote. The Electoral Supreme Court refuted  those claims, saying “there's no way a dead person's name can be used to vote […] because the official list also shows the voter's photo”. Cruceños (city locals) have since gathered at the Fexpo Cruz  (International Convention Center) in Santa Cruz de la Sierra, monitoring TED employees as they compute the ballots and asking them to respect their votes and demonstrate transparency during the official count. In the meantime, opposition voters hope the fraud does not change the outcome predicted by authorized polling company Equipos Mori on Sunday, a 49-51 percent victory for the “no.” They have expressed frustration with the slow count, and after witnessing multiple accounts  of fraud committed during voting day, are concerned the remaining ballots may be tampered with in an effort to skew results. No to eternal rulers, No to people hungry for power, No to the constitutional amendment. Bolivia says no. No Evo. No more. Bolivia ought to be respected. If one thing is clear from Bolivia's national referendum vote this past Sunday, it's that the Bolivian people have had enough of corruption. Update February 25, 2016. President Evo Morales conceded defeat in the weekend referendum according to a press release published by the Ministry of the Presidency .